Until the coming of the Lord Christ into our terrestrial world, we men really knew only about death and death knew about us. Everything human was penetrated, captured, and conquered by death. Death was closer to us than we ourselves and more real than we ourselves, and more powerful, incomparably more powerful than every man individually and all men together. Earth was a dreadful prison of death, and we people were the helpless slaves of death. Only with the God-man Christ "life was manifested"; "eternal life" appeared to us hopeless mortals, the wretched slaves of death. And that "eternal life" we men have "seen with our eyes and handled with our hands,"  and we Christians "make manifest eternal life" to all. For living in union with the Lord Christ, we live eternal life even here on earth. We know from personal experience that Jesus Christ is the true God and eternal life. And for this did He come into the world: to show us the true God and eternal life in Him. Genuine and true love for man consists of this, only of this: that God sent His Only-Begotten Son into the world that we might live through Him (1 John 4: 9) and through Him live eternal life. Therefore, he who has the Son of God has life; he who has not the Son of God has not life (1 John 5: 12)—he is completely in death. Life in the one true God and Lord Jesus Christ is really our only true life because it is wholly eternal and completely stronger than death. Can a life which is infected by death and which ends in death really be called life? just as honey is not honey when it is mixed with a poison which gradually turns all the honey into poison, so a life which ends in death is not life. Who is a Christian? A Christian is a man who lives by Christ and in Christ. The commandment of the Holy Gospel of God is divine: "live worthily of God" (Col. 1: 10). God, Who became incarnate and Who as the Godman has in entirety remained in His Church, which lives eternally by Him. And one lives "worthily of God" when one lives according to the Gospel of Christ. Therefore, this Divine commandment of the Holy Gospel is also natural: "Live worthily of the Gospel of Christ" (Phillip. 1: 27). The Lives of the Saints are holy testimonies of the miraculous power of our Lord Jesus Christ. In reality they are the testimonies of the Acts of the Apostles, only continued throughout the ages. 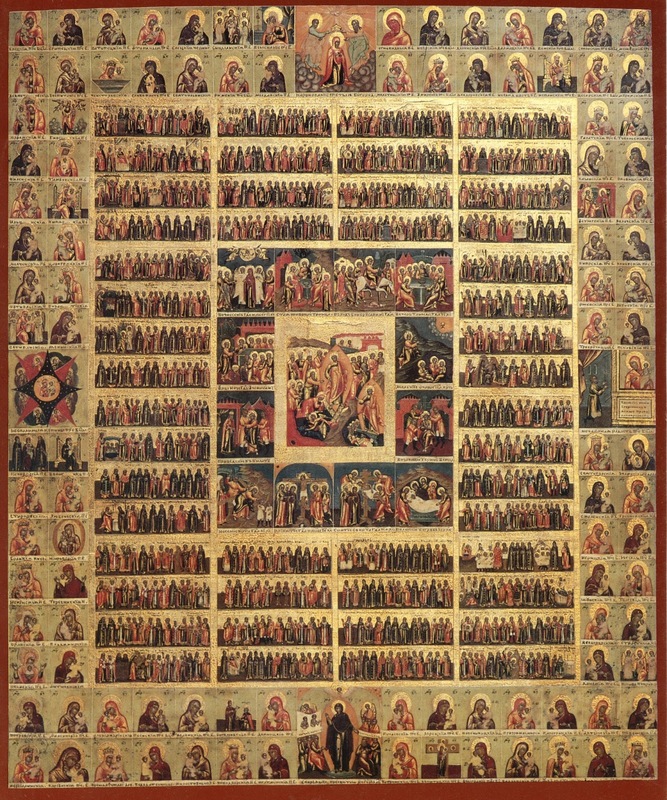 The saints are nothing other than holy witnesses, like the Holy Apostles who were the first witnesses—of what?, of the God-man Jesus Christ: of Him crucified, resurrected, ascended into heaven and eternally alive; about His all-saving Gospel which is unceasingly written with evangelical holy deeds from generation to generation, for the Lord Christ, who is always the same, constantly works miracles by His Divine power through His holy witnesses. The Holy Apostles are the first holy witnesses of the Lord Christ and His Divine-human economy of the salvation of the world, and their lives are living and immortal testimonies of the Gospel of the Savior as the new life, the life of grace, holy, Divine, Divine-human and therefore always miraculous, miraculous and true as the Savior's life itself is miraculous and true. And who are the Christians? Christians are those through whom the holy Divine-human life of Christ is continued from generation to generation until the end of the world and of time, and they all make up one body, the Body of Christ-the Church: they are sharers of the Body of Christ and members of one another. The stream of immortal divine life began to flow and still flows unceasingly from the Lord Christ, and through him Christians flow into eternal life. Christians are the Gospel of Christ continued throughout all the ages of the race of men. In the Lives of the Saints, everything is ordinary as in the Holy Gospel, but everything is extraordinary as in the Holy Gospel—both one and the other, uniquely true and real. And everything is true and real by the same Divine-human reality; and the same holy power—Divine and human—bears witness to it: Divine in an all-perfect way, and human—also in an all-perfect way. What are the Lives of the Saints? Behold, we are in Paradise, in which everything which is Divine, holy, immortal, eternal, righteous, true, and evangelical grows and increases. For by the Cross in every one of the saints the tree of eternal, Divine, immortal life blossomed and brought forth much fruit. And the Cross leads to heaven; it leads even us after the thief, who for our encouragement entered Paradise first after the All-Holy Divine Cross-bearer—the Lord Christ—and entered with a cross of repentance. What are the Lives of the Saints? Behold, we are in eternity: no longer is there time, for in the Saints of God Eternal Divine Truth, Eternal Divine Righteousness, Eternal Divine Love, Eternal Divine Life reign and rule. And in them there is no longer any death, for their entire being is filled with the resurrecting Divine energies of the Risen Lord Christ, the Only Vanquisher of death, of all deaths in all worlds. There is no death in them—in holy people: their whole being is filled with the Only Immortal One—the All-Immortal One: the Lord and God Jesus Christ. Among them—we are on earth among the only true immortals: they have conquered all deaths, all sins, all passions, all demons, all hells. When we are with them, no death can harm us, for they are the lightning-rods of death. There is no thunderbolt with which death can strike us when we are with them, among them, in them. And this holy truth about the God-man—do not the lives of countless saints most evidently and experimentally bear witness to it? For the saints are saints by the very fact that they constantly live the entire Lord Jesus as the soul of their soul, as the conscience of their conscience, as the mind of their mind, as the being of their being, as the life of their life. And each one of them together with the Holy Apostle loudly proclaims the truth: "Yet not I live, but Christ liveth in me" (Gal. 2: 20). Delve into the Lives of the Saints: from all of them wells forth the grace-filled, life-creating, and saving power of the Most Holy Theotokos, Who leads them from podvig to podvig, from virtue to virtue, from victory over sin to victory over death, from victory over death to victory over the devil, and leads them up into spiritual joy, beyond which there is no sadness nor sighing nor sorrow,  but rather everything is only" joy and peace in the Holy Spirit" (Rom. 14: 17), joy and peace from the victory obtained over all sins, over all passions, over all deaths, over all evil spirits. In addition, the Lives of the Saints contain in themselves Orthodox ethics in their entirety, Orthodox morality, in the full radiance of its Divine-human sublimity and its immortal life-creating nature. In them is shown and proven in a most convincing manner that the holy mysteries are the source of the holy virtues; that the holy virtues are the fruit of the holy mysteries—they are born of Them, they develop by Their help, they are nourished by Them, they live by Them, they are perfected by Them, they become immortal by Them, they live eternally by Them. All the Divine moral laws have their source in the holy mysteries and are realized in the holy virtues. For this reason the Lives of the Saints are indeed experiential ethics, applied ethics. Actually, the Lives of the Saints prove irrefutably that Ethics is nothing other than Applied Dogmatics. 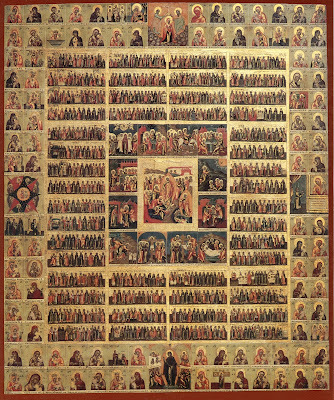 The entire Life of the Saints consists of the holy mysteries and the holy virtues, and the holy mysteries and the holy virtues are gifts of the Holy Spirit Who accomplishes all in all (1 Cor. 12: 4, 6, 11). In the Lives of the Saints are shown numerous but always certain ways of salvation, enlightenment, sanctification, transfiguration, "christification," deification; all the ways are shown by which man conquers sin, every sin; conquers passion, every passion; conquers death, every death; conquers the devil, every devil. There is a remedy there for every sin: from every passion—healing, from every death-resurrection, from every devil—deliverance; from all evils—salvation. There is no passion, no sin for which the Lives of the Saints do not show how the passion or sin in question is conquered, mortified, and uprooted. By the same token in the Lives of the Saints there are very many marvelous examples of how a youth becomes a holy youth, a maiden becomes a holy maiden, an old man becomes a holy old man, how an old woman becomes a holy old woman, how a child becomes a holy child, how parents become holy parents, how a son becomes a holy son, how a daughter becomes a holy daughter, how a family becomes a holy family, how a community becomes a holy community, how a priest becomes a holy priest, how a bishop becomes a holy bishop, how a shepherd becomes a holy shepherd, how a peasant becomes a holy peasant, how an emperor becomes a holy emperor, how a cowherd becomes a holy cowherd, how a worker becomes a holy worker, how a judge becomes a holy judge, how a teacher becomes a holy teacher, how an instructor becomes a holy instructor, how a soldier becomes a holy soldier, how an officer becomes a holy officer, how a ruler becomes a holy ruler, how a scribe becomes a holy scribe, how a merchant becomes a holy merchant, how a monk becomes a holy monk, how an architect becomes a holy architect, how a doctor becomes a holy doctor, how a tax collector becomes a holy tax collector, how a pupil becomes a holy pupil, how an artisan becomes a holy artisan, how a philosopher becomes a holy philosopher, how a scientist becomes a holy scientist, how a statesman becomes a holy statesman, how a minister becomes a holy minister, how a poor man becomes a holy poor man, how a rich man becomes a holy rich man, how a slave becomes a holy slave, how a master becomes a holy master, how a married couple becomes a holy married couple, how an author becomes a holy author, how an artist becomes a holy artist. From Orthodox Faith and Life in Christ, by Father Justin Popovich. Trans. by Asterios Gerostergios (Belmont, MA: Institute for Byzantine and Modern Greek Studies, 1994), pp. 32-50.